I was planning to write about a current event issue when this story hit my in-box. I am no longer shocked by issues like what I am about to report. Our kids and teens have been seduced for decades. Harry Potter hasn't helped nor has Twilight. Both kids and adults have been introduced to the paranormal in dozens of TV programs and movies. So much so, in fact, that the paranormal is the new normal. 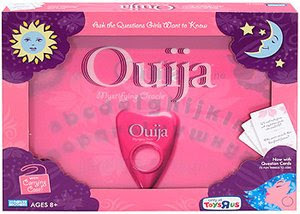 So now Toys-R-Us has a cute little pink Ouija board and one that glows in the dark, both marketed for children. They advertise that kids as young as 8 need to have these new sorcery objects! (Well, they don't call them "sorcery objects" but the Bible does.) I know it is billed as a "toy" but I have enough personal experience that I can tell you it is blatant divination. The Bible speaks extensively about "divination" and "sorcery." Entire civilizations have been wiped out because of sorcery. Those perpetrating this are aiming at younger kids every day. Serious reproach against witchcraft and divination is given in Deuteronomy 18:9-15. Are Christian parents going to say that this new kids' Ouija board is "just a game," just like they say Harry Potter and Twilight are "just fiction" and can't hurt anyone? You can bet some will! Let me tell you my personal ordeal with a Ouija board. I was 23 years old. (I know that was back in the Bronze Age, but divination hasn't changed.) I was addicted to a Ouija board. I had people driving 100 miles to put their hands on the glass object, ask the board questions, and have it spell out answers. I was so good at it that the glass object could move with no hands on it. It made predictions and many of them came true. It instilled power in me that was stunning. The glass object that spelled out words would often spin around the board in a frenzy, and it was always talking about dark, evil things. All predictions were negative. It scared many participants. It has supernatural power, but since it is of the devil, not all predictions came true because the devil does not know the future. When I asked the board where it got its power, it spelled S-A-T-A-N.
One evening I put the board away and felt a presence in my apartment. I did not want to open my eyes because I knew I would see a demon. If you think I am doing this for sensationalism, I can tell you that it has not been easy reliving my experience. I do it only to spare some of you from my mistakes. I had roots in a solid church in my teenage years and I sensed I had crossed a line. I seriously repented, took the board and glass object out to a bonfire and forever said good-bye to its evil. That was in accordance with Acts 19 which says that those who practiced magic gathered up their instruments and burned them. Sadly, I had obtained almost a lust for the paranormal from the Ouija board and that is why most participants then move to deeper and darker occultic practices. The Ouija board is stepping stone number one. But isn't this just a game like Monopoly? you ask. Going back to my personal experience - the glass object was profane, cursed God, and sometimes flew off the board in a rage. Evil spirits were present to be sure. So no, it's not just like Monopoly. This is playing with FIRE. If anyone you know, child or adult, is playing with this force of evil, warn them. March on over to Toys-R-Us and register a complaint. There are many Web sites that speak of people getting obsessed/addicted to this so-called game. Others say this was the start of their paranormal journey. Sadly, most toy stores will put profits before protecting children, but speak up nonetheless. This is just another sign of the times and of the lateness of the hour. In these last days, evil will wax worse and worse. That is why we as believers are called to be salt and light in a dark world. If a Christian feels they can dabble in darkness and still be "light," they are seriously deceived.